​Was Orwell’s "1984" A Prophetic Warning? When published in 1949, I doubt if anyone ever thought the world depicted in George Orwell's novel "1984" would ever come into reality. Orwell described a complete enslavement of humanity by a privileged political elite. 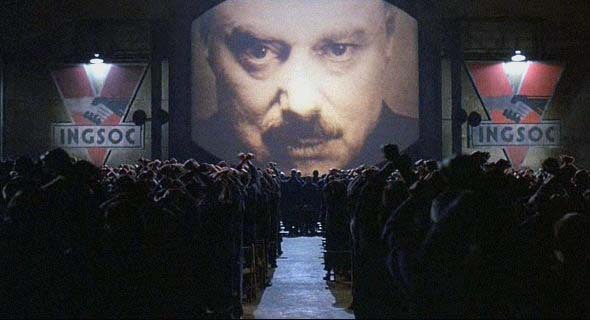 The government system was depicted by a Big Brother character that preached a socialistic system of collective behavior (Ingsoc) from giant television screens mounted everywhere. People worked in little cubicles, with the main character, Winston Smith, assigned to rewrite past newspaper stories to fit the new historical record that supported the nation’s party line. There was an invented government language called Newspeak. All individualism and independent thinking was regarded as a "thoughtcrime" against the people. To make sure everybody lived in the assigned "zombie-like" state directed under Ingsoc, small video cameras were mounted on all streets, public buildings and job sites. Finally, the world was engaged in a perpetual war against a vague enemy, which appeared to be the driving force behind the need to keep such a strict disciplinary code of existence. Now, over a half century later, does the world described by Orwell sound as fictional as it did in 1949? Today it almost seems as if the book was used as a blueprint for the very thing that has happened to us in most of the world's industrialized countries. Workers do their jobs in small cubicles and live under the constant gaze of video cameras. Television sets seem to be operating everywhere we go, even on public streets, and the faces of would-be political leaders are constantly feeding our minds with the propaganda of the day. Our elected leaders are carefully selected by the wealthy elite, and their campaigns heavily financed by big corporate powers that have been given complete control over the election system by the Supreme Court. Our monetary system has been taken over by the Federal Reserve, a powerful organization run and controlled by rich bankers of the world. News reporters who dared to expose corruption in government have stood charged with treason. Our history and government textbooks have been rewritten to teach our children a version approved by the totalitarian state. The very word "Orwellian" has become part of contemporary language among those who would rebel against the system we are being forced to accept as our own. It seems that the final part of this contemporary copy of the Orwellian world has been perpetual warfare against a vague and unclear enemy. Now, with the sudden appearance of the Islamic State militants, or ISIS, as a powerful and dangerous military force sweeping the Middle East, we have a masked enemy to declare perpetual war against. Ironically, the Islamic State forces are using American manufactured weapons, furnished to fight against reported tyranny against earlier unclear terrorist forces also raising havoc in that territory. Was the CIA or some other covert U.S. government group responsible for manipulating the turmoil in the Middle East that led to the formation of the ISIS militants? It all seems to fit the Orwellian mold so perfectly. This group has no national allegiance. It is comprised of fighters from many nations; some say even the United States. Its attacks have no problem crossing borders. Thus it is seen as an enemy against the world. It is the perfect enemy for a declaration of perpetual war. This keeps the wheels of the military industrial complex turning. There is great profit to be made by everybody concerned. It is a perfect creation of the Orwellian world, except it is coming 30 years later than George Orwell said it would. The only concern we should be having is that Orwell did not predict what was going to happen next.